Covering flower pots with a glass top is an easy and affordable way to create a customized table that will last a long time. You decide the style of the pots and the type of filler, such as stones, dried flowers or other decorative elements, according to your space. Plus, you control the overall cost of your finished product. This way, you can be sure to end up with a piece of furniture you love --- and still stay within your budget. Choose flower pots and fillers that highlight your color scheme and create a sense of balance. Measure the width and length of the area in which the table will reside. Take accurate notes. You will need this information to decide the width and amount of flower pots needed. Decide what general height you wish your table to be, and find ceramic pots that best match your measurement. Choose a flower pot height that is easily found in your local garden center or nursery. Gather your pots together to form the shape you wish your table to be. Circular or rounded shapes are best, as squared edges may be hazardous and do not match your pots' shapes. 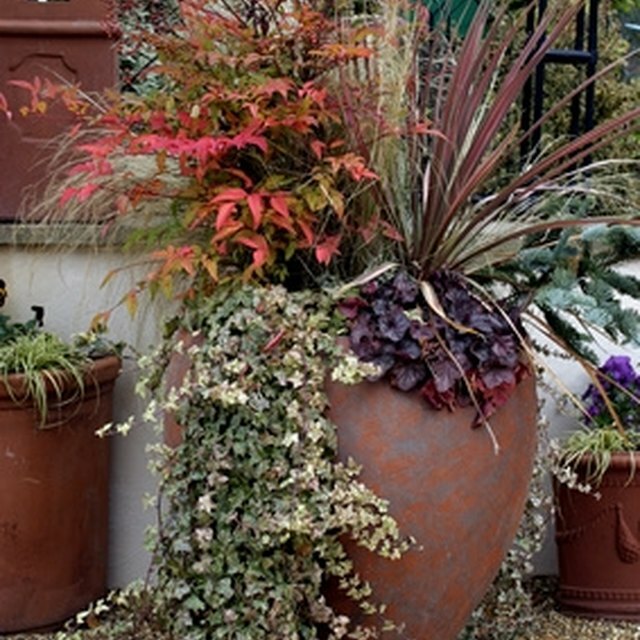 The pots do not have to have uniform width; different widths may add an extra element of design as long as the heights match. Find fillers for each pot. You can use colored pebbles, potpourri or other dried vegetation to add aesthetic quality to your design. Measure the length, width and/or diameter of your pots gathered together, adding an inch of space to each measurement. You will use these measurements to order your glass. Purchase glass and have it cut by a professional to match your table's dimensions. Have your glass tempered, or heat-treated, to increase its strength and durability and to reduce the risk of breakage and injury. Pack the pots with sand or soil, 3 to 4 inches below the brim. Cover the top layer with the filler of your choice. This is a cost-effective solution for filling the pots, and the weight of the sand or soil will reinforce the table's sturdiness. Clean your glass thoroughly with any household window cleaner. Having a clean surface will ensure a strong bond for your glue. Allow the glass to dry completely before continuing. Dot the outer brims of your pots every 3 inches with silicone glue. For example, if your table is 24 inches in diameter, you will need eight evenly spaced dots of glue. Brush your glue evenly over the brims using a disposable paintbrush. This ensures an even, firm and clean hold for your tabletop. You may add more dots of glue wherever needed as long as you create an even, thin layer. Center the glass on top of the brims. It is best to have assistance with this step. You may want to place a heavy object on top of the table to form a better bond as the glue dries. Do not overexert yourself by lifting any objects that are too heavy for you. Ask for assistance when needed, and always lift with your knees. Land of Odds: Crafter's Dilemma: What Glue Do I Use?